In a medium, deep skillet, heat the EVOO, one turn of the pan, over medium-high heat. 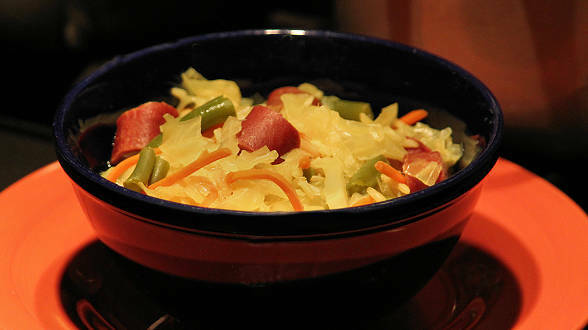 Add the cabbage, carrots and green beans and cook until slightly softened, 4-5 minutes. Add the turmeric and cook for another minute. Add the frank and cook until heated through; add 1 cup chicken stock and cook for 3-4 minutes. Stir in the cooked rice and the remaining 1 cup chicken stock. In Recipes-list.com we have selected the most viewed recipes from category - uncategorized . Enjoy the best recipes specially selected for you! Halloweenie Stoup is the right choice that will satisfy all your claims.